I’ve been making my own cruelty-free cold process soap for over a decade, I love it because I know exactly what’s in it and it’s super moisturizing to my skin. I also love giving out soap as neighbor Christmas Gifts each year, it’s an inexpensive gift that is full of homemade love. 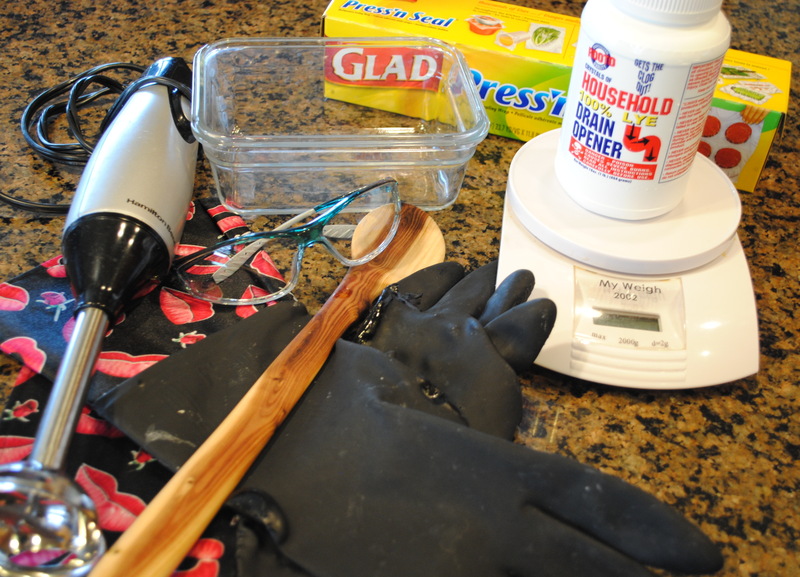 An accurate kitchen scale, 2 glass or stainless bowls (not pictured above), a wooden spoon, a stick blender, Soap Mold (a rectangular glass container is used here), 3 or 4 tupperware containers of various sizes for measuring lye, oils and water into (not pictured above) Plastic Wrap, Candy making thermometer (not pictured above), Long Chemical Resistant Gloves, dishwashing variety gloves will do fine in a pinch, cuff them to catch any soap that could run down your arm) and Safety Goggles. Get ready: Put on your gloves, safety goggles, tie your hair back if it is long. Wear a long sleeve shirt, pants and closed toe shoes. The safety equipment and long clothing may seem silly, but lye (or caustic soda) is a chemical that WILL burn your skin (it’s the primary ingredient in drain cleaners), and can cause blindness, so PLEASE USE CAUTION. Now for the ingredients. 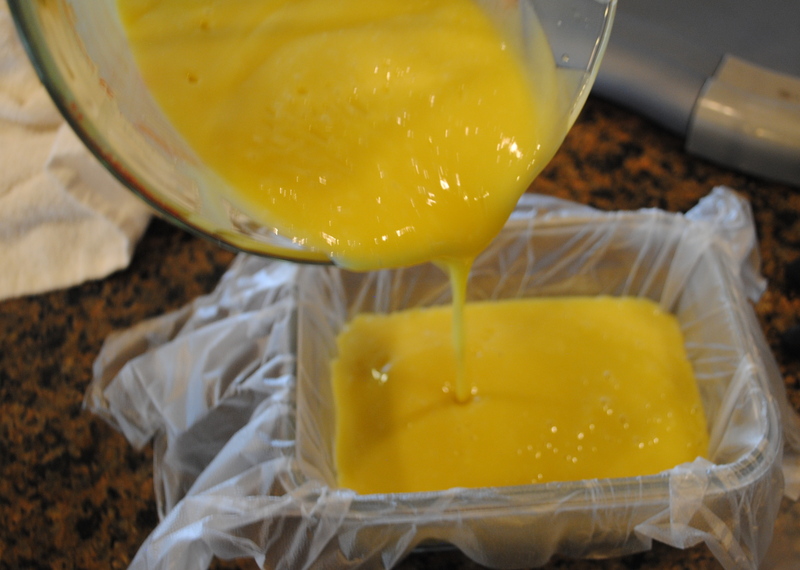 I’m giving you a super simple recipe that will make a mild and moisturizing soap with really good lather. 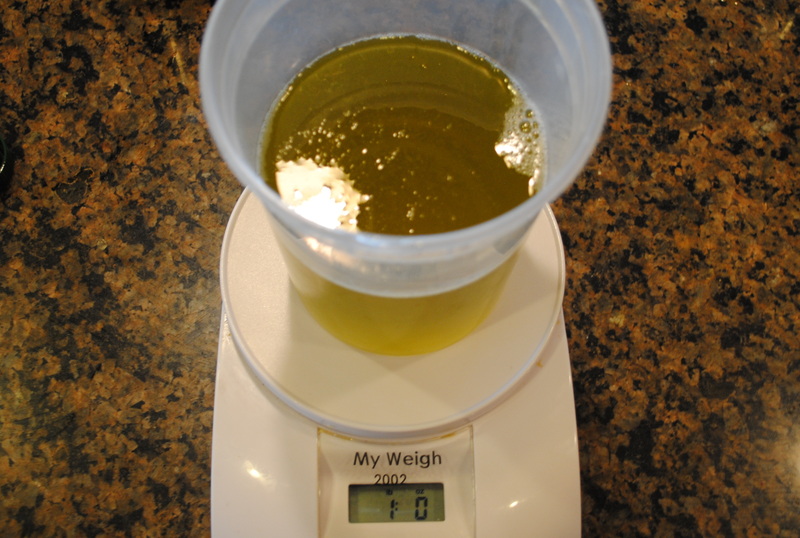 PRETTY PLEASE use a kitchen scale, soap MUST be made by measuring by weight, not volume! 1 lb test batch, if you’ve never made soap, I suggest starting with this smaller batch. Once you’ve made the test batch above successfully, go ahead and make a 5 lb. batch following the same method as below (but with new measurements and use bigger containers all around). I buy my lye at my local Ace Hardware Store, It is getting harder and harder to find, so if you have trouble, you can also source it here. Do not use Drano, Liquid Plumber or any other type of lye formulation that is not 100% pure lye. Put a small round tupperware container on your kitchen scale, then turn it on, this will allow it to start at a zero weight without adding the weight of your container to the total weight. 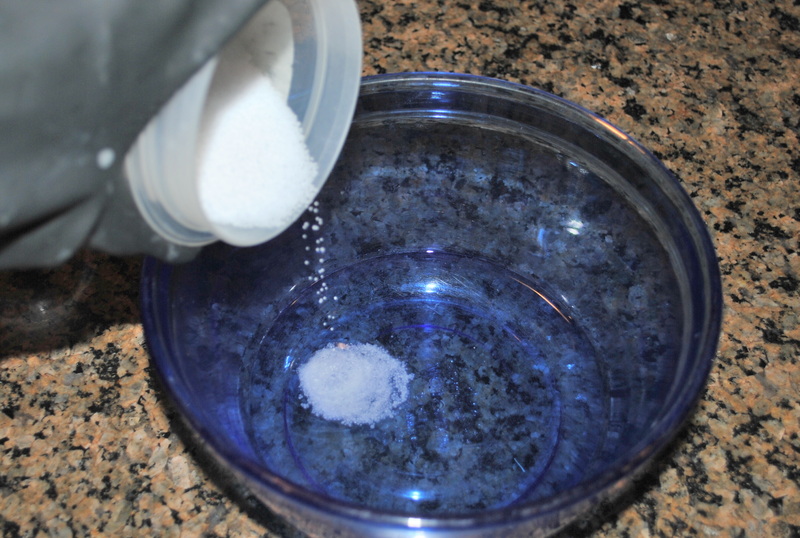 Pour distilled water slowly into the container until you have 3 or 4 ounces of water in your container. Add distilled water to glass or stainless bowl. 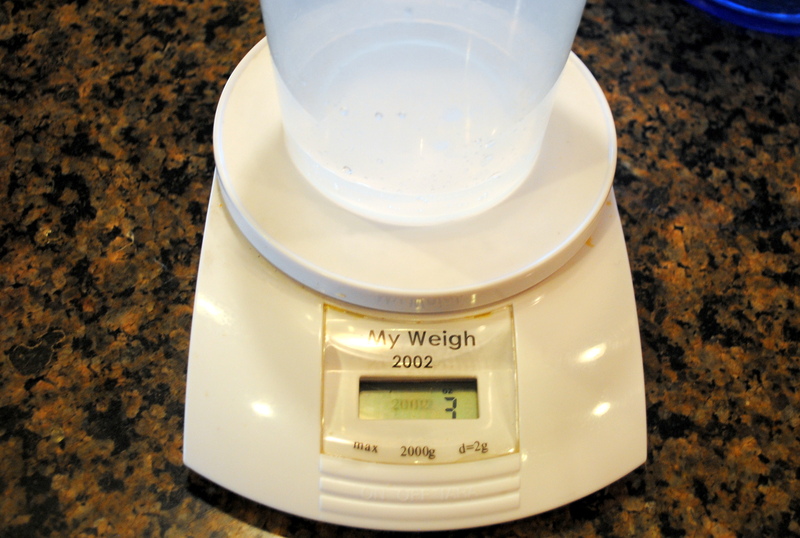 Turn off your scale and put a different small tupperware container on the scale (not the same one you used the water for, you don’t want any lye touching water at this point). Turn it on and CAREFULLY weigh the lye. I like to measure the weight of the lye in grams for the greatest accuracy. Slowly Pour the lye into the water, this is (literally) best done outdoors with your free longsleeved arm covering your airways so you don’t inhale toxic fumes. The temperature of the water at this point can be over 150 degrees (sometimes it even boils). So set the bowl cautiously aside with your gloved hands AND some pot holders. Using the same method as before, but with a clean container, Slowly add 6 ounces of the coconut oil to your tupperware (if it’s not all ready liquid, warm it up briefly for easier measuring). 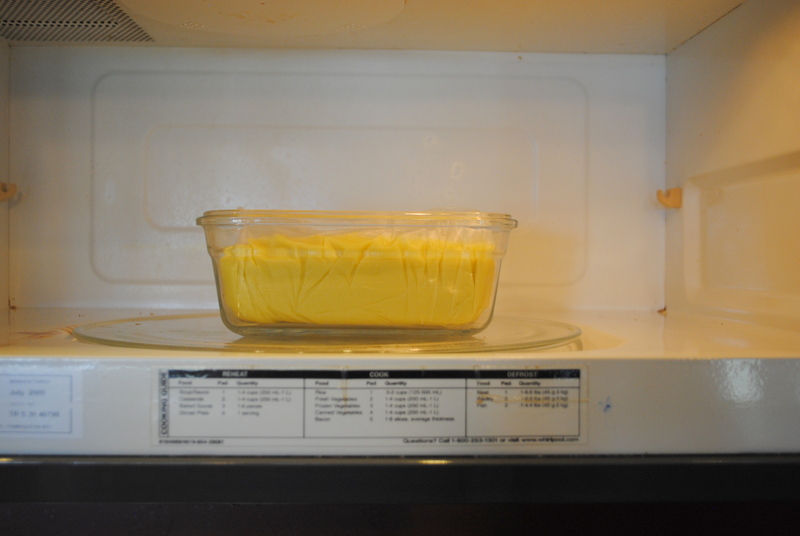 Now heat the oil in the microwave in 15 second intervals until it reaches a temperature between 100-120 degrees farenheit. 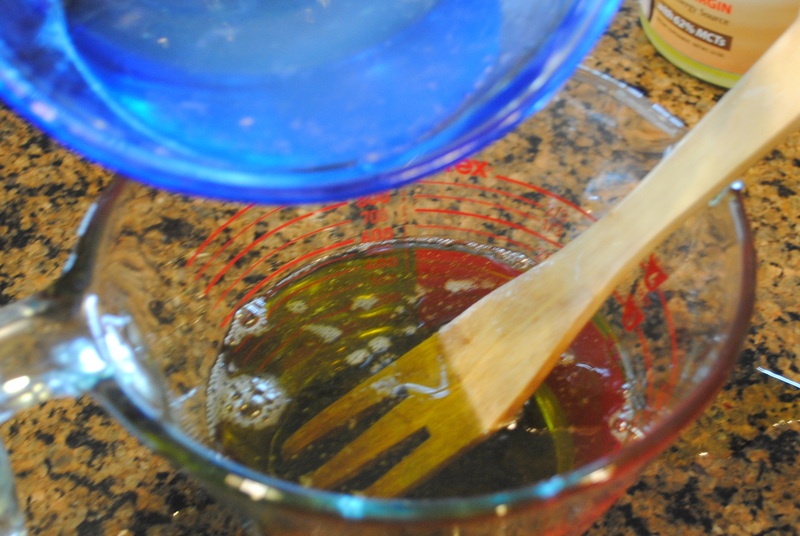 You can also heat the oils briefly on the stove-top (in a pot of course). Next, check the temperature of the lye. If its anywhere between 100-120 degrees, you are good to go. If it’s still too hot, give it another minute or so to cool down. As long as the lye and oils are somewhere between 100-120 degrees they’re within an appropriate range for mixing and starting the trace process. 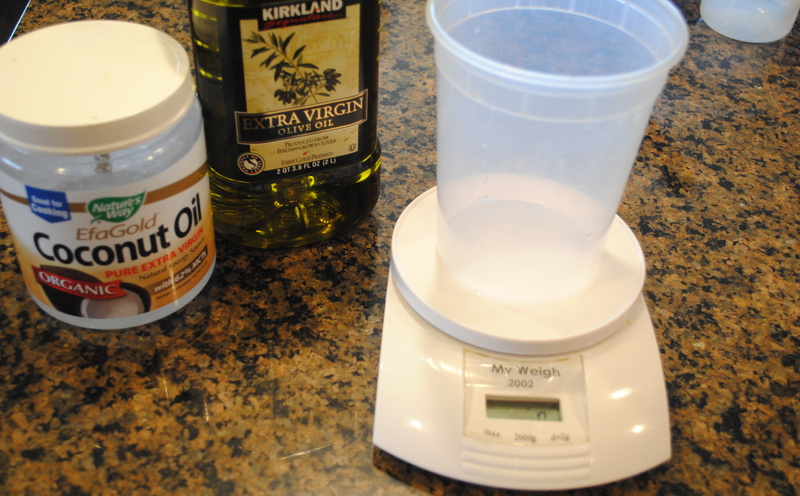 Put the oils into a glass or stainless bowl (I used my 4 C. glass measuring cup) and Carefully pour the lye into the oils. 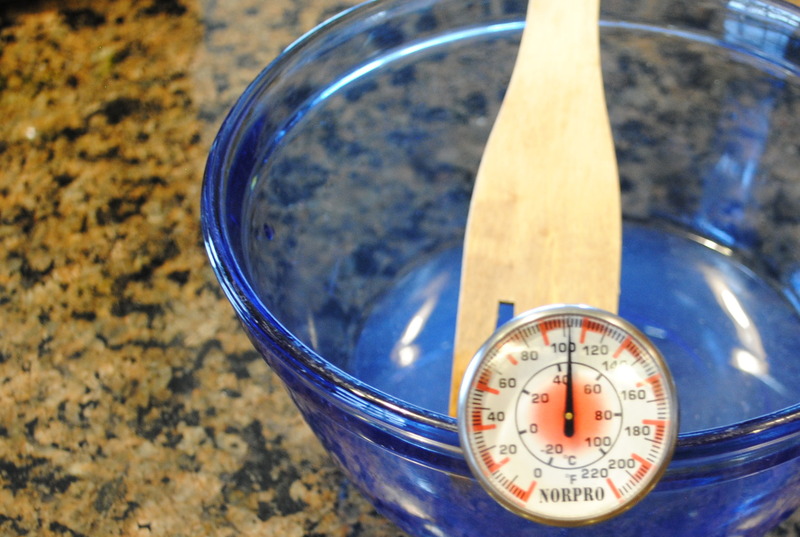 Now stir briefly with your wooden spoon (or in my case, wooden spork thingy). Then use the stick blender to bring your soap to trace, trace is the state where the oil and lye water are thoroughly combined. 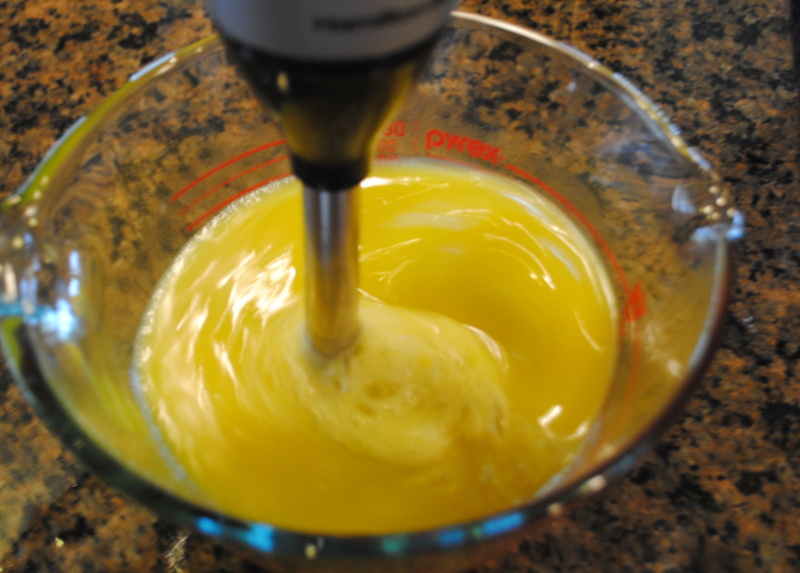 It will thicken, not quite as thick as pudding, but like a stirred custard. Soap is fully traced when it can support a drop (you will see the outline of the soap drop and it won’t disappear). This should take less than 5 minutes with your stick blender on high speed and this particular recipe. At this point you can add your essential oils or leave the soap unscented. 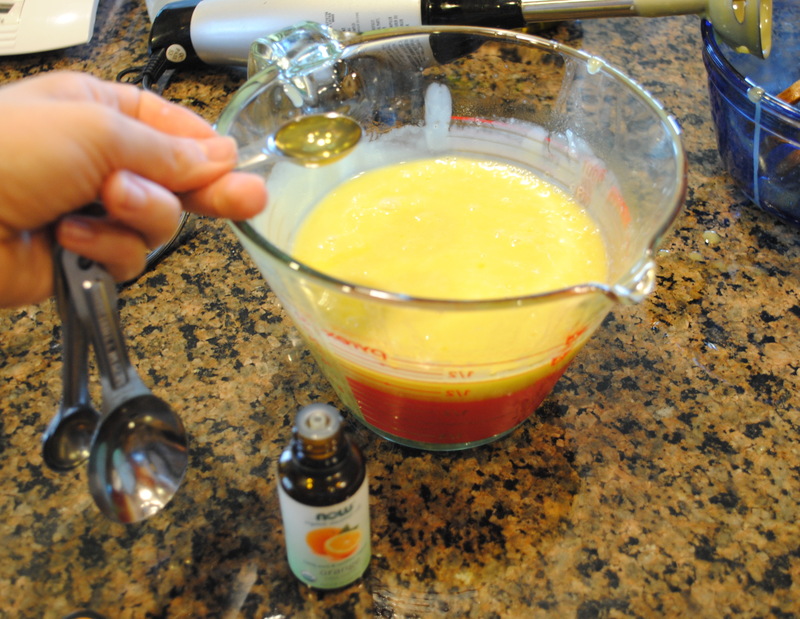 Just pour in a teaspoon or two of essential oil per pound of soap you are making and give it another whiz with the stick blender til fully incorporated. 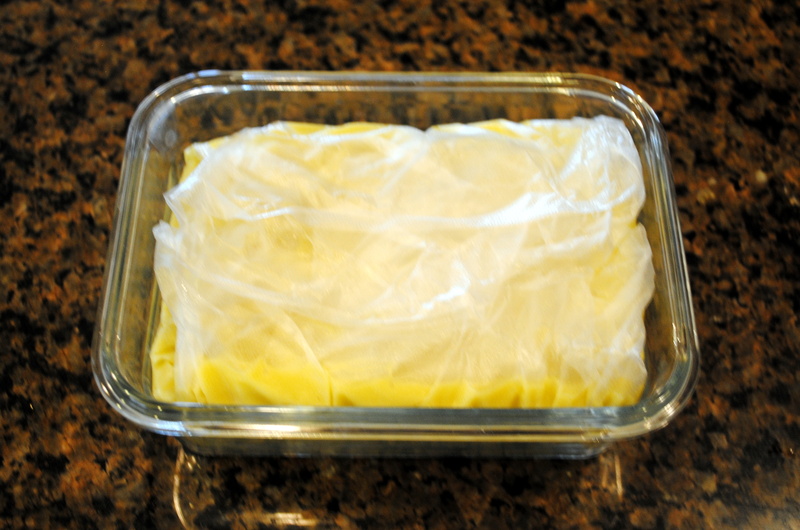 Now quickly line the mold you plan to use with plastic wrap (it makes removal easiest) and pour the prepared soap into the mold. I used a glass rectangular container, but even a shoe box or drawer organizer will work. Soap can form a weird ash layer when curing sometimes so I make a little soap burrito and cover it all up with plastic wrap to prevent the ash layer from forming. It doesn’t make for the prettiest soap, but hey, I’m not selling it. Put soap in oven or microwave (weird I know) and close the door. You want to protect it from drafts and give it a nice cozy place to incubate. It will get really warm and go through several phases, including a gel phase while incubating. This is NORMAL. Just leave it undisturbed for 24 hours. Now your soap is ready to cut! Just pull the plastic wrap off it and go to it! The photos of cut soap are from a 5 pound batch. I like using the cute crinkle cutter Erika gave me for my birthday. Let soap cure for a week or two before using. Longer cure times will result in a firmer longer lasting bar, which is great, if you can stand to wait! Oh, and if I get my coconut oil on sale (like I always do) this soap costs less than a dollar per bar to make, which is a slam dunk compared to the fancy bars at Whole Foods. If you’d like to formulate your own soap recipes, I suggest you visit The Sage Website for their lye calculator, and their Soap Blog for more detailed instructions and ideas. The Sage is also an excellent and affordable place to purchase soap-making supplies including soap molds, essential oils and fixed oils. You can go as extravagant as you like or you can keep it simple which is more my style. A word about essential oils in soap-making: vanilla will turn the soap brown, peppermint will burn your naughty bits if you use too much (I suggest 1/2 t. or less for a batch this size) and cinnamon essential oils will not only burn your skin, but will also cause your soap to seize solid in the bowl. So stick to the basics 😉 I only use essential oils as I find fragrance oils to be artificial and cloying (same goes for artificial coloring) I’ve tried natural colorants but in the end, I always go back to plain soaps, bonus that they are also the least irritating. (FYI, lavender buds and most other herbs turn brown and will look like dead flies in finished soap). So cool! I don’t trust myself enough to do this with out hurting myself but I am very impressed!! Do you have an immersion blender you use only for soap and then another for food? It’s easier than it looks. Some folks have an entirely different set of soap making tools, I just make sure to put all the tools through the dishwasher and be sure they come out really clean. 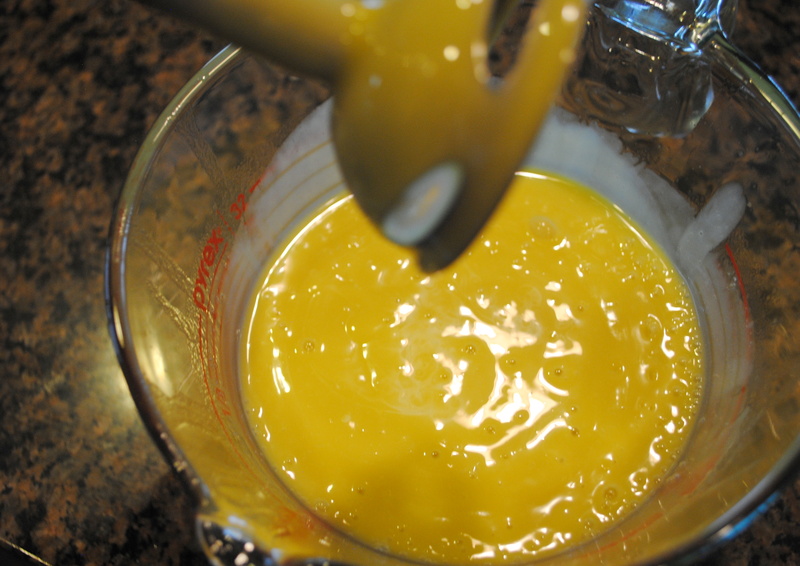 The soap doesn’t harm the immersion blender at all, so as long as it’s washed well, I say use it for both applications. It is considered unsafe to use the same tools for soap making as for food as the lye will not be neutralized by washing. you will need something like vinegar to counteract the lye in order to render the item safe to use with food. in doubt, i would always use a ph strip to test. I’ve read that too, but many soapmakers just use the dishwasher to sanitize and clean their tools, just like I do without any adverse effects. i tried it and set my laser thermometer in the container.. it melted the plastic right off so def not neutralized. Not at all. you have to understand the process. the oils no longer exist , the lye no longer exists .. it has gone through the process & become SOAP ! I dry wipe the bits of SOAP from the hand blender & bowls..wash as usual. Dishwasher is the best . but to be in a panic about reusing the mixer ? No way..
women in the olden days certainly didn’t kill their families in droves b.c they reused a dish. along the same lines.. do you think there comes a time , say 5 yrs or 10 when the ‘oils’ / soap would become rancid ? NO.. because it is now SOAP….. the bars will grow harder in time is all. Seriously doesn’t take as long as you might think. I outlined it step by step in the photos just so people who have never made it before would have really clear instructions. Almost all store bought soaps contain tallow, which is not only gross, but also drying and irritating to the skin. Agreed. Would we get somewhere to buy em’? Aaah.. I will check em’ out. Thank you! looks lovely! i have been wanting to make soap, but just not gotten round to it… this is inspiring me to go for it 🙂 thanks! Oh I was only kidding love! Well so as to not broadcast my address to the entire websphere… I’ll send it to you under separate cover. Believe me, he sits right down the hall and cannot escape my constant nagging for vegan soap. In the interim, I’ll keep using my Dr. Bronner vegan soap. Exactly! And thanks for giving me a good excuse to check out my vedged out email account. It’s been collecting cobwebs….. Nothing wrong with Dr. Bronners! I miss my cold process soap :-(! WOOHOO, maybe pre-movie night, would Ike hang out in the garage? Fantastic! All coconut oil is too drying for me and all olive oil too slimy, that’s why I’ve combined them in this recipe. I hardly ever french mill it, just because it’s so time consuming, but sometimes I do a hot process in the crock pot, that way the soap is ready to use the same day you make it. What island did you live on?!? Intrigued! I agree though, the mix of oils works well. Castille takes FOREVER to harden, coconut works in the way tallow does, it hardens it. Although pure coconut soap will lather in salt water. Sounds incredible Sarah! I didn’t know that pure coconut soap lathers in salt water, pretty cool! 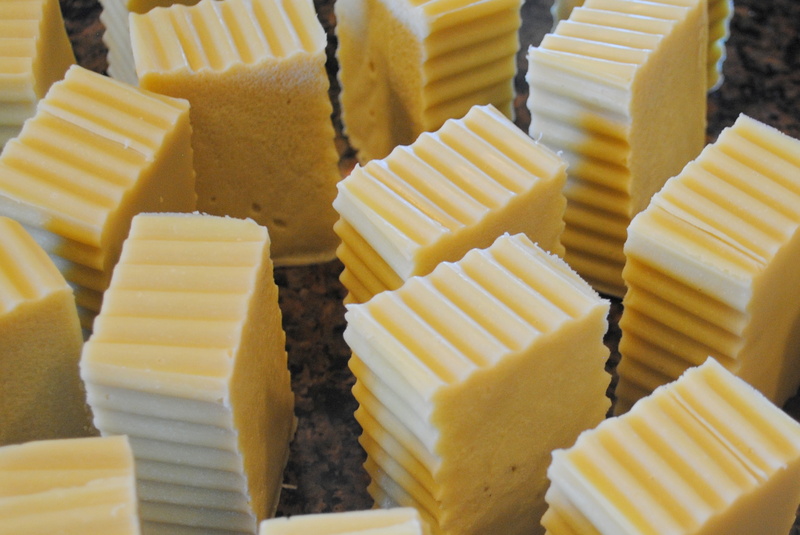 Amazing – I’ve always wanted to try making cold-process soap instead of melt-and-pour. This looks beautiful! I have a few questions: using lye scares me… is there an alternative? And what if you don’t have a stick blender? Will a regular blender work? As far as I know there is not a reasonable alternative to using lye in soap, lye is pure in it’s solid form and is a catalyst to make all soap form. When soap cures, all traces of lye are gone and the soap is mild and creamy. In the olden days people used ashes, lye is far more reliable. Any soap that you have in your home was made with some form of lye. I wouldn’t be so scared of it. Since I know you are a mother with littles about, just make sure you use caution, you could do soap making when they are in bed for the night. I trust the process enough that my 9 year old daughter helped me make my last batch. We both wore all the protective clothing and gear of course. It’s worth it to me to make inexpensive cruelty free soap! No problem my dear. I really hope you take the time, once you get the hang of it, you can start making larger batches, which is more time effective and rewarding. the use of a food blender will allow for more air to become incorporated into the soap batter and can result in unsightly bubbles. 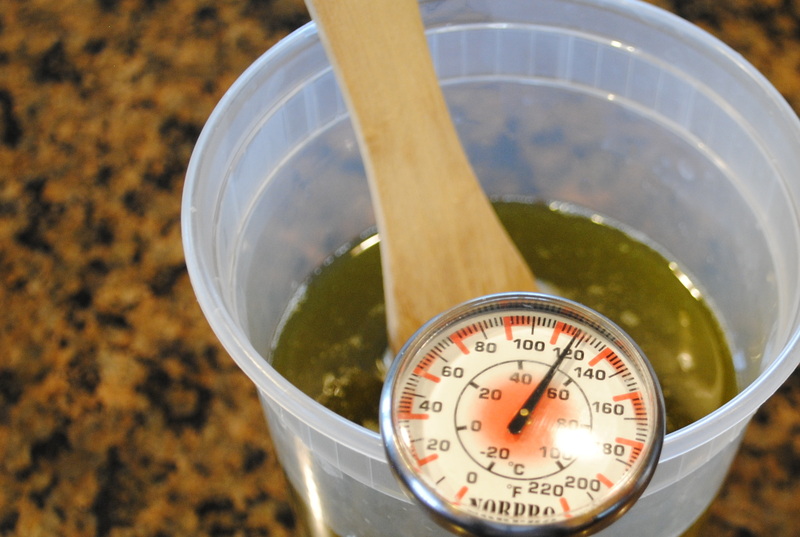 Tools used in food prep can be used in lye soap making, but shouldn’t be used for food after. I would hate for someone to waste a $50+ blender, because they werent aware they shouldn’t use it in food preparation after exposing it to lye. Really?!? I’ve been making soap for over 15 years. This is my method, which works fantastic. Do what you like when you make your own soap. MANY others have made this recipe with success using the tools and method I’ve described. Oh and you can use a regular blender, just make sure to vent the lid, be extra careful with pouring and pulse briefly until it reaches the trace stage. I bought my stick blender for about $20, I love it for this purpose since there is less transferring of the caustic soap in it’s initial stages. Wonderful…. maybe that’s what I should use my Bed, Bath & Beyond gift card for! Thanks again! ABSOLUTELY. You’ll love it for creamy soups too! Don’t be scared! Yes, it is caustic when you use it but with common sense you will be fine. I look at it like making hot candy syrups – lock the kids and animals up and have fun! Lol – thanks, sounds good to me! Love this idea! I was just thinking yesterday that I need to start making a list of homemade crafts to make as Christmas gifts. The only problem is -is that I don’t own a microwave. Maybe I can borrow one?! I was all set to make this next weekend anyway. I hope it works out – keep your fingers crossed. I buy soap from a local woman that scents all her soaps with lavender oil, then adds in extras. I like her lavender/peppermint. Do you have a suggestion for the amounts? 1tsp of lavender & 1/2 tsp of peppermint? Or would that bee too strong in combination? yeah i am on GC. so hopefully in a couple more years will be able to vote! It’s really not that much more work than making a good pizza my dear 😉 The dead lavender flies are scratchy but oats are a nice addition…. I love this idea. I have nominated you for the Beautiful Blogger Award, check it out. Thanks for giving me inspiration. I saw that post a while ago too. I think this soap looks like cubes of real butter : yes! A lot of work though! I love this idea! Homemade gifts are my favorite both to receive and to give. It’s so much more special when a person has invested her/his time and energy into the gift. Plus, whenever you use it, you’re reminded of the giver! Exactly the reasons why I love to give and receive homemade gifts as well! I think I have to buy a crinkle cutter now! So pretty. Never thought about giving out self-made soap as gifts. Wonderful idea! It’s not as hard as it looks, I swear, it’s just another recipe. Try it! You’ll love having your own homemade soap soooo much! Thanks for sharing this Somer. I’ve been wanting to try making soap, but have been intimidated. You’re right, with all the holidays approaching now is the time to give it a go if ever there was one. And I’m with my fab sis, the crinkle cutter rocks. I’m so glad it’s inspired you. 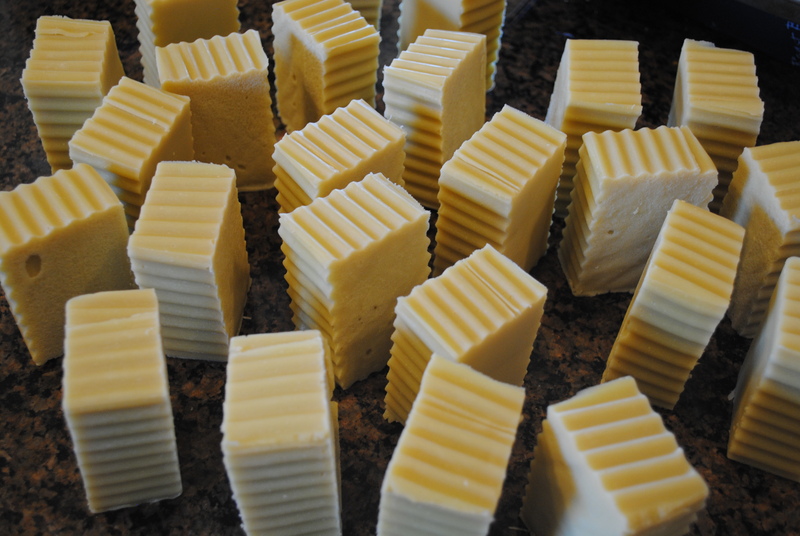 I really adore making soap and I think you will too. It’s one of those things that seems complicated, but it’s really not. I love my crinkle cutter, and of course I use it for all my veggies as well! Whoa. I’ve never read a soap post. Thorough, easy to follow, I’m certain that should I get it in my mind to make soap for gifts (or for myself), this will be the post I go back to. Do you know any good shampoo recipes? Thanks, Somer! Thanks, Somer! This is so amazing. I’m a do-it-yourself kind of person (well, getting there, anyway) so was delighted to find this. Was a bit intimidated by the lye, but I suited up and went for it – easy! My soap is in the resting phase now. A few questions – at what point is the soap safe to touch? Should I wear safety gear through the cleaning up process, too, or is it safe once the oils are mixed in? I used a plastic container left over from some snack food seaweed to put my soap in, and it didn’t melt, so I hope that’s ok? It’s the perfect size for 4 bars of soap. Also, even though the lye-water and soap mixtures were both below 120° when I combined them, I noticed the temp went to 130° while I was mixing. is this normal? Rebecca! How cool! I’m making a batch of soap right now too! The snack container is fine. 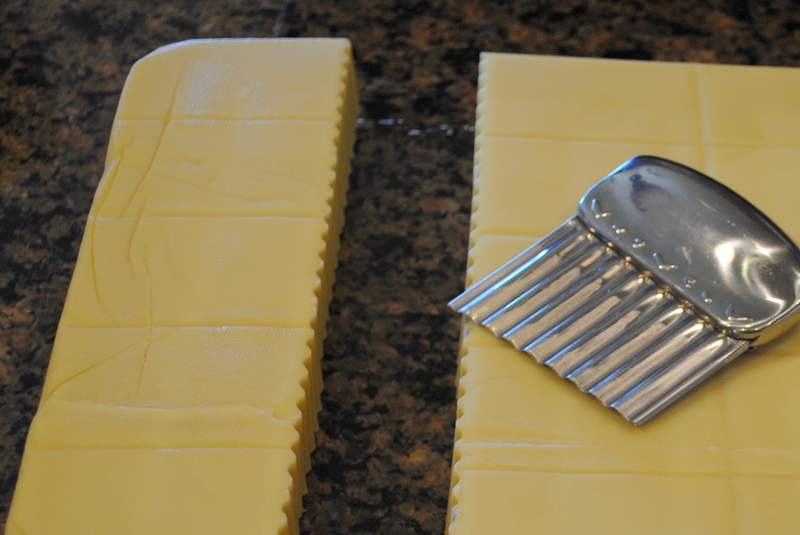 The soap will be safe to touch when it is ready to cut (24 hours). Do use your safety gear while you clean up. The temperature rise while mixing is normal. Best of luck! One more question, Somer – after I cut the soap (which was so fun, by the way! ), how should I store the bars to cure? Should they be wrapped up, or open to the air? I place the bars an inch or so apart and leave them uncovered to air dry, they can be used now, but really it’s best to wait a few weeks for the bars to sufficiently firm up before use so they don’t dissolve too quickly. Oh and I think you’re awesome for making the soap! I hope you love it as much as I do! I love it already, Somer! Of course I couldn’t wait the whole week to try it! I can’t believe what a nice lather it makes. I hope it does well on my skin, since my skin is absolutely disgustingly dry and flaky all winter long. I didn’t scent this batch, but will try lavender on the next batch. Disappointed that the coconut smell didn’t last, so might try that, too, if there is a coconut essential oil. Also want to make a batch with tea tree oil! My bars came out a lovely shade of pale yellow-green – beautiful! hello holiday gifts! can’t wait to try it. thanks for the cool idea. So exciting! I made a giant batch the other day with Annie from An Unrefined Vegan. She commented that it’s an easier process than it looks! Let me know how it turns out! Thank you, thank you! I got my package yesterday and have already tried the soap – it’s wonderful. The Burt’s Bees lip balm is great too. I lost your email address when I purged my inbox (without checking for important messages first, doh) and I can never understand Facebook, so I’m not sure if I actually left you a message there or not. Thanks again! I’m sold on making my own now. I just need to find lye. Apparently it’s used in meth labs, so it’s harder to get your hands on in Canada. I’ll keep looking. I’m so glad it came! That is so funny about the meth labs! It’s really tricky to find lye here too and probably for the very same reason. I can only find mine at one hardware store. I would try your local chemical supply company, they often have 50 lb bags of the stuff. You could ask them if you could have a part of a bag that’s been damaged or ask if they can get it for you in a smaller size. I’ve done that in the past when I was selling the soap retail. Good luck Heidi! Hi, Somer – more questions! What brand stick blender do you use, and how long do you run it? My Proctor Silex died during my third batch of soap. I think I just ran it too long and it overheated. But I’m confused about how long the soap needs to be blended. Judging from some of the comments on the Sage website, it seems like you only have to do it long enough so that the mixture is homogenous, but not necessarily thickened. I’m confused – and need a new blender! So cool you’ve all ready made 3 batches! Way to go, I love my homemade soap! I do, too! You wouldn’t believe how much I love using it! I’m so glad you posted this. My soaps are lasting so long – much longer than what I’d been buying. My new batches have fragrance – one lavender, one lime. I made them as gifts, but of course I’m going to have to try them, too 🙂 And if I find out that my batch that was thinner turns out well, I’ll make even more soap, because then it will be really quick! With the water it is more than 5 lbs. When the water cures out, you are left with 5 lbs of soap, sorry, should have clarified that. 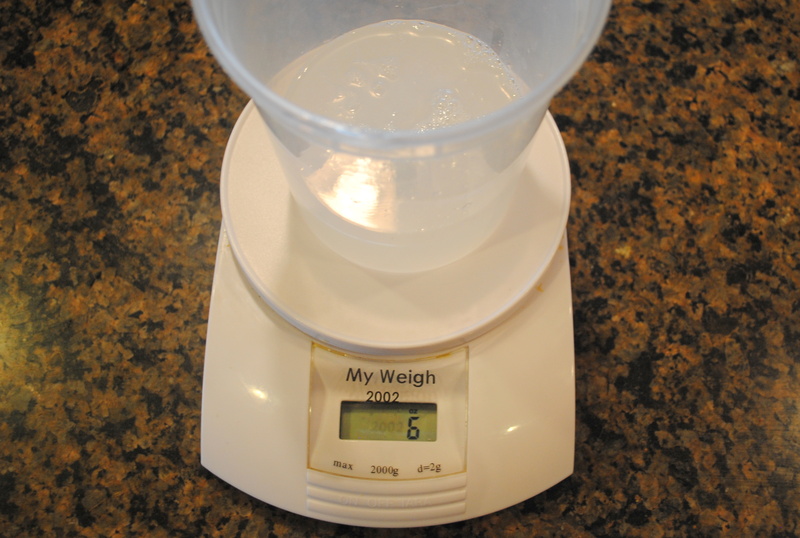 Typically in soap recipes, the water weight isn’t calculated. amazing!!! what if i use cracked pepper, rosemary or other dried herbs in the soap? how do you put honey in the soap? You can use herbs but they will turn brown. Cracked pepper may irritate the skin, so use with caution. I don’t use honey since I’m vegan, so I don’t know how it would work in the soap. I recall reading that it can cause a temperature increase and possible separation problems, so you may want to do some research if you try that. In my understanding it’s extracted from wood ash. Every vegan soap I’ve purchased is made with lye in some form. It’s made from wood ash. Originally soap was made from lye (water and wood ash) and animal fats. Maybe that’s where the confusion is coming from. Thats probably it- I remember the story of the romans discovering soap at the bottom of the sacrificial mountain and assumed all lye would be animal based. Nice to know I can gift my vegan friends my soaps! Does anyone know of a place I can buy cruelty-free lye? I’m new to the whole soap-making thing and I’m not even sure CF lye even exists. Thanks! 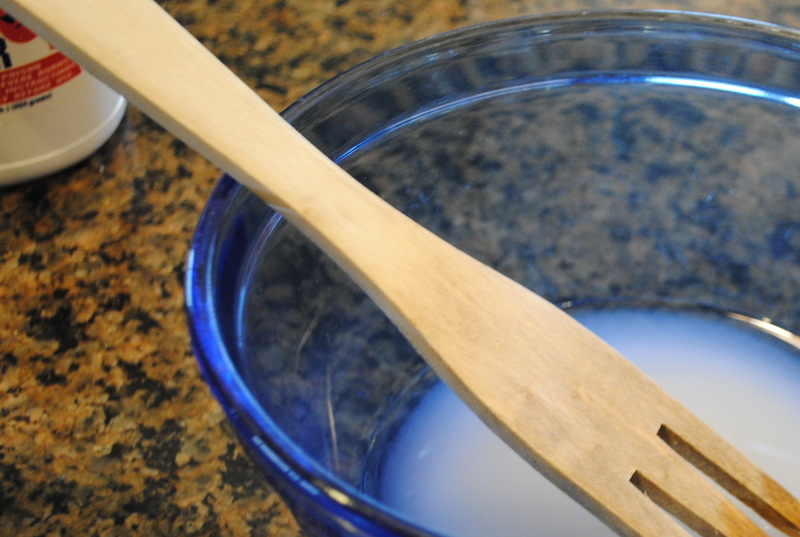 Lye itself is simply a bi-product of wood ash. No animals harmed there. I love making cp soap. I have made soap for 5 yrs. I use a few oils in my recipe. But I love this simple 2 oil recipe. You are correct this soap if made right can be used in 48 hrs. Thank you for sharing this! 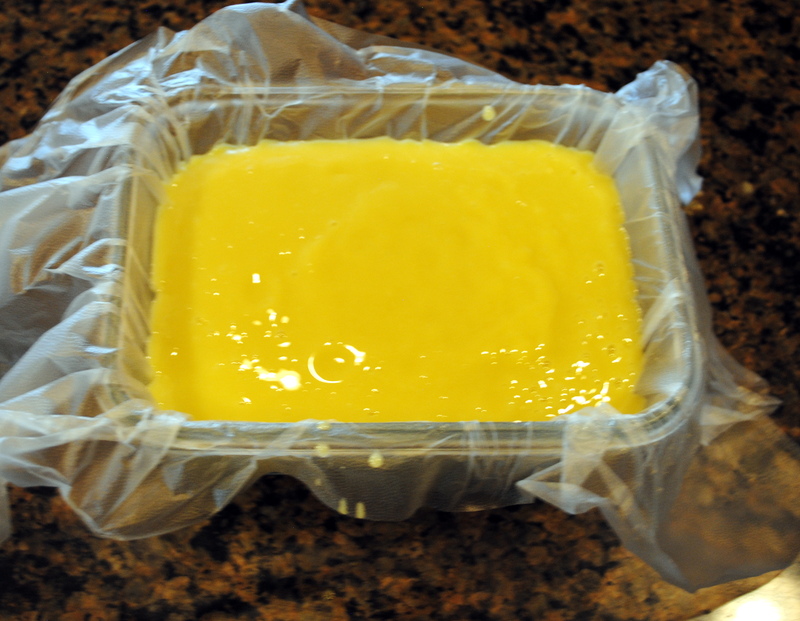 Normally cold process soap requires a minimum curing time of 4-6 weeks. As this recipe has a very high concentration of Olive oil, it will be a soft bar and will take the longest to fully cure meaning 5+ weeks OR more. If used in the 1-2 week time as stated, it would result in an incredibly soft bar that will dissolve quickly and will be very drying on the skin (the curing time is used to allow the soap time to become more mild and for that final few percent of lye to saponify. I would probably edit this to lengthen the curing time IMO. Also, to preserve the smoothness of the top of the soap, i would spray at least 91% alcohol on the top. this will prevent the soda ash from building up. Thanks for your feedback, but I’ve made this recipe dozens of times and it works great! its not about it working, its about the recipe being unsafe. unless this recipe was made using the Cpop method which it is not, there is still unsoaponified lye in the soap at 1-2 weeks cure time. i’m a soapmaker with 17+ years of experience. 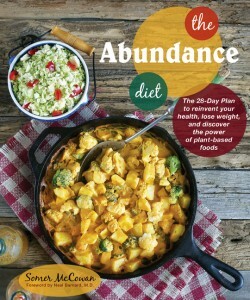 this is an excellent, basic and accessible vegan recipe that i have used a few times now with great results. cure time is not for lye to dissolve but for the water content to reduce and harden the bar. it’s in no way unsafe to use a partially uncured soap, it will just not last as long. thank you for sharing your soap recipe somer! Question: What kind of Olive Oil do you use? Where do you normally buy it? EVOO? Or something else? Loooove the blog! I just use extra virgin bought at the grocery store, but any kind of olive oil will do. Dear Vedgedout, The reason why I am writing, is like you I care to have a soap that is entirely plant based. Yet, I see that there are recipes for potassium hydroxide to make lye from wood ashes. I do not know how they make the store bought lye, and I do want all plant based products for the soap. 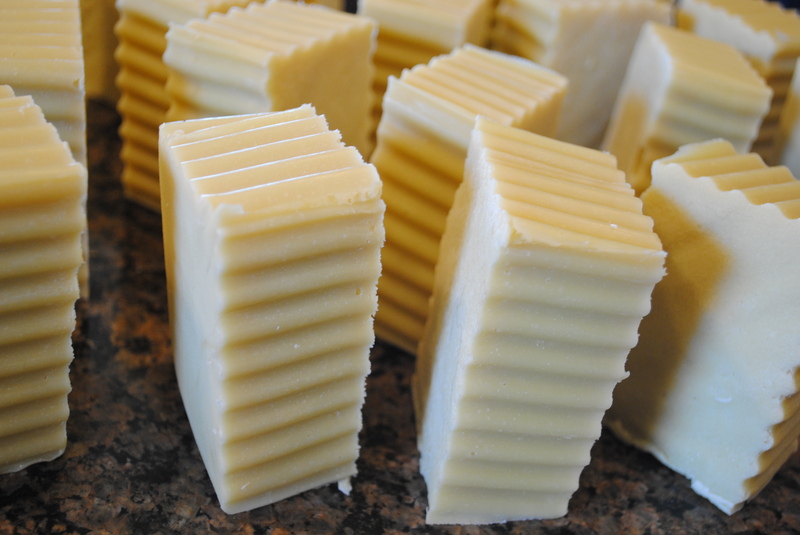 Have you made a hard soap using home made lye? Michele, I have not ever used wood ash to make soap. You’d be best off referring to sites that have that kind of information. I understand the soap itself is cruelty free, but I’m looking for a brand of lye that has not been tested on animals. Does anyone have any ideas where to find this? I’m at a loss. Hi Anna, you’d likely have to write to the companies individually to obtain this information. When I was first taught this same recipe, I was told that the coconut oil is for sudsing,but to be careful because it is very drying. Nowadays they claim it moisturizes. What gives? I’d love to know, from someone who makes soap. Coconut oil in soap is good for lather. However, an all coconut soap would be extremely drying, which is why I combine it with other oils. I don’t know if it’s because the saponification process changes its properties or what causes it to be more drying in soaps, but yes, coconut oil in its natural state is a great moisturizer. 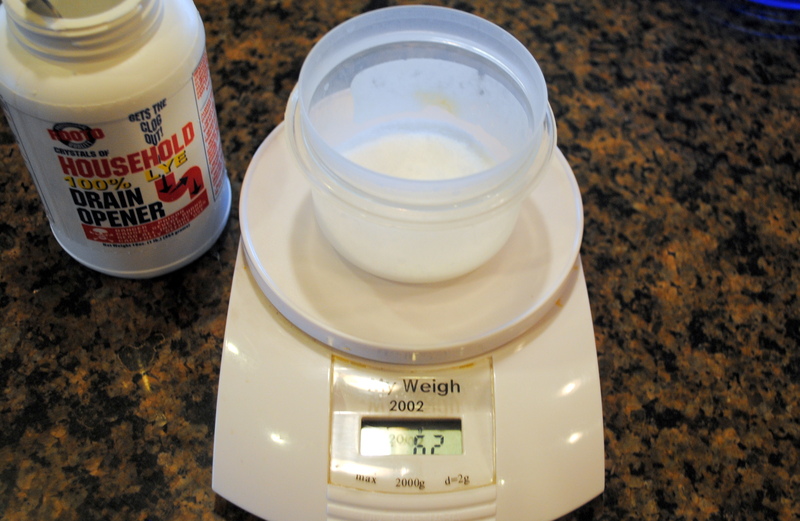 Do you use the four cup measuring cup when you do the five pound batch? Could you use the big buckets from Home Depot or lowes? You can use whatever container you like, I generally use a big soup pot. Are their any scents you’d say are good/not good for soap? All depends on personal taste, but some essential oils, like cinnamon, can cause the soap to seize. Kick Ace Extra Sharp Raw Vegan Holiday Cheddar Cheese Ball. Virtual Vegan Potluck Edition. The Best Damn Vegan Chocolate Chip Skillet Cookie. I work hard to create original content, including my photographs and written text. Once I publish something, it's covered under copyright laws immediately so please don't re-publish content from this site elsewhere without my permission. Please contact vedgedout@gmail.com for permission/questions/inquiries. Thank you.